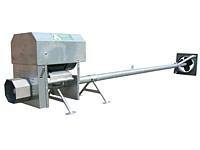 The long shaft mixer L-E1 is an agitator at a reasonable price and designed especially for circulation channels, slalom systems or for cross channels with manure removal opening. The agitator is available with a rectangular compartment for installation by means of guard rails and built-in wall box or with a round compartment for concrete cone installation. Various bearings and sealing systems are available. Pull or push blades can be applied as well. The size of the blades is corresponding to the motor rating from 7.5 to 22 kW. The motors operate with 1450 RPM and are driven with a reduction gear transmission via v-belt. A switchbox with timer should be used to control the operation of the agitator and to ensure regular continuous stirring. A PTO through shaft is available at extra cost. The direct drive via the tractor’s PTO unit allows to significantly increase the stirring output if needed. The electric motor has to be decoupled in case when a tractor is used as driving device.